Alien 5 being on hold is not groundbreaking information. It seems many mainstream media outlets have been sleeping softly under a rock for the past year, having forgotten that Alien 5 has been shelved until Alien: Covenant has had its run. The headlines today quoting franchise icon Sigourney Weaver's quotes concerning the Alien 5 project are becoming so rehashed it's borderline comical. UK based media site Express have run a "new" story that has grabbed the attention of many top news aggregator platforms. In the report they call out Sigourney Weaver as "blaming" Ridley Scott for the postponement of Neill Blomkamp's Alien 5. This is not entirely true. It’s one of those things we wanted to do this past year, but I think Ridley [Scott] didn’t want them all coming out at the same time. For casual readers this may be shocking news, but to Alien fans and the members here at Alien5-Movie and Scified, we know this has been common knowledge for a year now and more so, is not something that needs to be worried about. 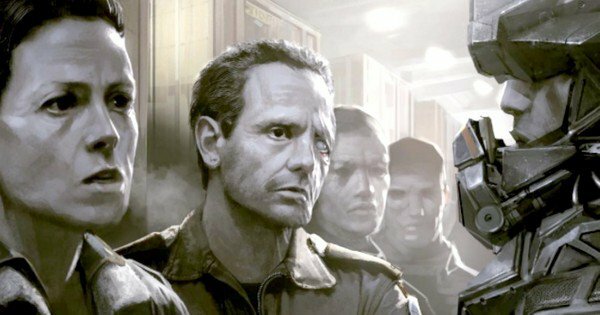 Fox and Ridley Scott have decided to hold off on Blomkamp's Alien 5 until the Prometheus sequel is released. This makes sense as to avoid confusion between properties and to allow Ridley and Neill to formulate a coherent plot which can incorporate both ends of the Alien universe spectrum, intelligently. What we ACTUALLY know for sure is that Fox took a serious interest in Blomkamp's Alien 5 script and had the project greenlight to begin prep. Concept artists were commissioned to create a number of pieces for the film prior to it being put on hold. Ridley Scott signed on as Executive Producer and is eager to see the project evolve and grow into something that can work, canonically with the rest of the franchise. We also know Alien 5 will NOT "erase" Alien 3 or Alien: Resurrection, as previously speculated. Alien 5 is happening, it's just not happening this year, and that's okay. For those who wish to avoid the clickbait / rehashed news and who would prefer to remain up to date on actual "breaking news" on Neill Blomkamp's Alien project, then you've found the right place. Sigourney Weaver's comments have not changed for a year and they won't change until Alien: Covenant has run its course and Fox are ready to pursue Alien 5 to the fullest. With so much interest and profitability riding on this project, fans need not worry about its eventual fate - Alien 5 will happen. Just be patient. 4 Fan responses to Alien 5 being on hold is not groundbreaking information. It sounded very clearly like Alien 5 WOULD be "erasing" Alien 3 and Alien: Resurrection. So how do we "know" it's not going to be? I have covered this a few times before... and we have to look at the Financial things and also how movies are accepted and persevered by the Public. Prometheus was a movie that takes hard work to understand, its a movie to re-watch and take in other clues and its not a movie that a casual viewer and none avid Alien fan can just watch and then figure out..... never mind see its connected. So bold was the task of following up on the path they had chosen with the Engineers being Godlike Creators of life throughout the Galaxy... that it was taking a long time to get a Final Draft done. It seems more anticipation was building for this project than a Prometheus 2 mainly because of more Alien Xeno links... Alien 5 was a Good idea, maybe seems a more simple Pop Corn Flick rather than a more Complex Plot for Prometheus 2 but it seemed more fans would be interested in Alien 5 due to Xeno links...... and Ridley had said Alien 5 was a good plot but it did tread on the toes of Prometheus 2 plans a bit... so there are one or more conflicting elements..
That the only way to push answers for Questions left by Alien and Prometheus and to get a movie that would be anticipated would be to give the Xeno Answers sooner rather than latter or at least set them up more than Prometheus did and also give Fans some Monsters related close to the Xenomorph. Add a Alien Prefix and then go on to sugest that a new Trilogy would be made to Tie Prometheus and Alien together but it would be more closer to giving us the Xenomorph Origins and Agenda behind it... than delve to much and deep into the Engineers. It would get more fans to be interested, and also giving us more answers would allow Alien 5 to come out after and be free to explore stuff that would maybe spoil or step on the toes of the Prometheus sequels if Alien 5 came out first. If Prometheus 2 was to be less Xeno than Prometheus and more Godlike Engineers and Fans did not want to see it as much and if Alien 5 was a hit.... it could effect plans on making a Prometheus 3. And once fans have seen Alien Covenant and its sequel and get much more if not the full Xeno lowdown... and Alien 5 touches upon Engineers in a small detail.... maybe these movies would engage non-Prometheus fans who now have had their Xeno Fix and Answers... to ponder what more is there to those EVIL SOB's who created the Biological Warfare.. This allows Fox to then make another spin off that would connect Prometheus and Alien Covenant with the Engineers more deeper. As far as both movies.... you dont want them coming out at the same time.... it would be like Disney bringing out Star Wars Rogue One and Star Wars EP 8 in the same year. And so maybe Alien 5 and Alien Covenant sequel could be worked on around the same time or year apart?